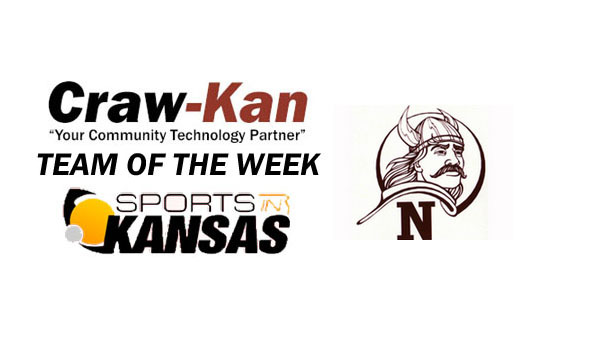 The Northeast-Arma Vikings football squad have earned this week's Craw-Kan Team of the Week. The Northeast-Arma Vikings football squad have earned this week's "Craw-Kan Team of the Week" for their 35-6 victory over Maranatha Academy in week two of the football season last Friday. "It was a good win. We faced a few unknowns going into the season, replacing players lost to graduation and opponents like Maranatha that were unfamiliar." Northeast head coach, Phil Hobbs said. Northeast (3A) was led by junior quarterback, Drew Mills, who had 247 rushing yards and four touchdowns on the ground for the Vikings. Mills also passed for 51 more and a touchdown. Senior Antonio Slingluff, an All 2-1A running back last season, chipped in 114 yards on the ground and picked up 15 tackles on defense. "We were still searching in week two to fill spots and I feel we put something together that will work," Hobbs said. "Our players are confident in what we will be able to do as we progress through the season." Northeast (1-1) lost a close one in week one to Neodesha (14-12) and will have Anderson County (1-1) at home this week. The Vikings, who moved up to 3A this season, are in the same district as Colgan, Erie, and Humboldt with two playoff spots on the line. The Vikings are looking for their first playoff appearance since 2002. Northeast has two playoff appearances in playoff era (1982, 2002).